A recent story in the news is about a solar plant recently completed in China that was designed in the shape of a panda. However, the images initially circulated were all artists concepts and not photos of the actual plant. Eventually Snopes was able to obtain an actual photo of the plant and we decided to try and find it in Google Earth. 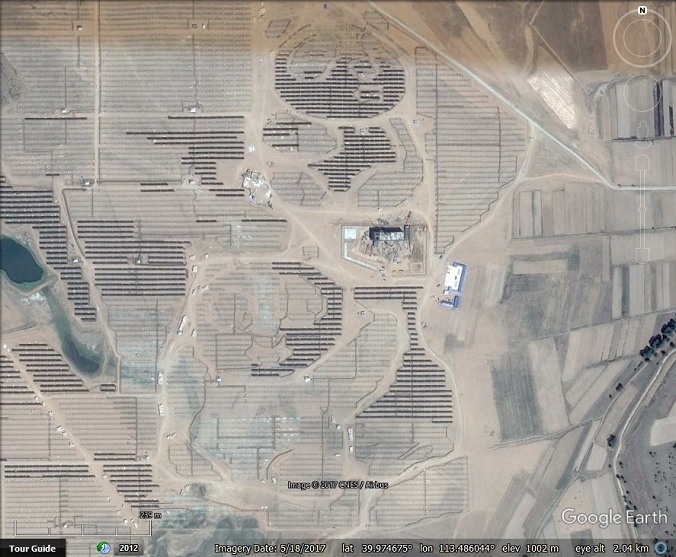 We knew the solar plant was somewhere in the vicinity of Datong, Shanxi, China, and we found a large number of solar plants in the region, but could not find the panda. 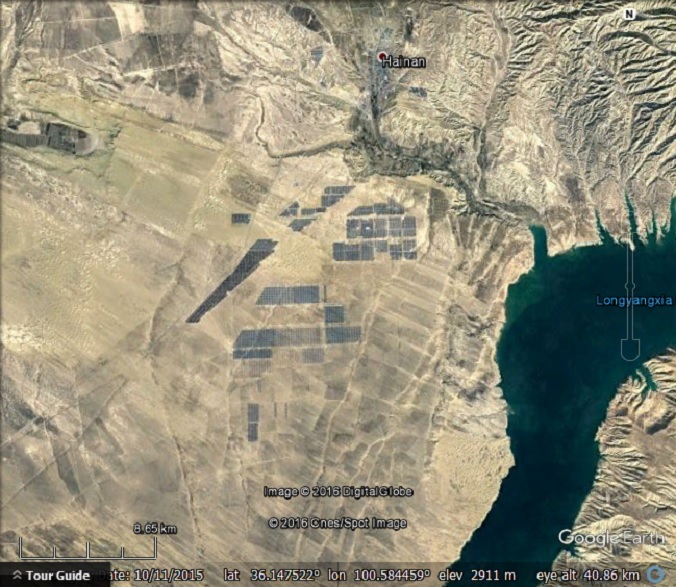 Then we found this article that features a screen shot from Google Earth and once we knew what to look for, we found it quite quickly near a solar plant we had already identified. The panda solar plant as seen in Google Earth in an image dated May 18th, 2017. There are actually two pandas. 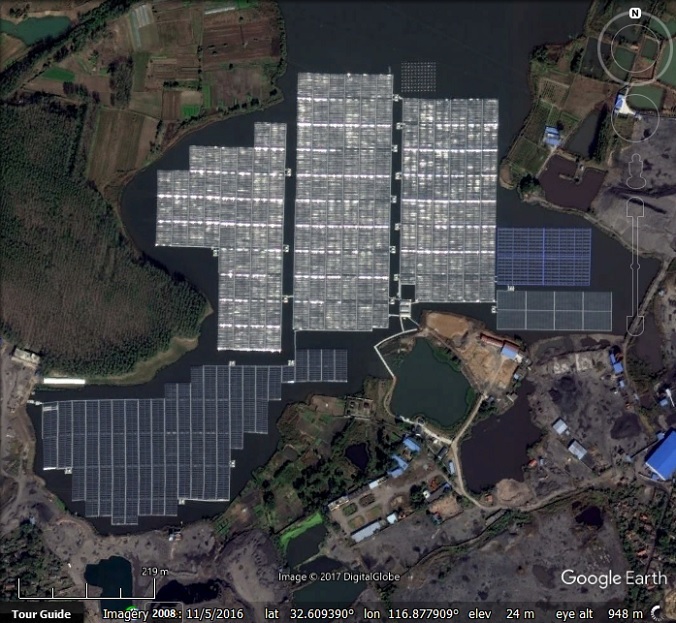 As we discovered when looking at floating solar, solar plants are springing up almost everywhere you look, especially in China. 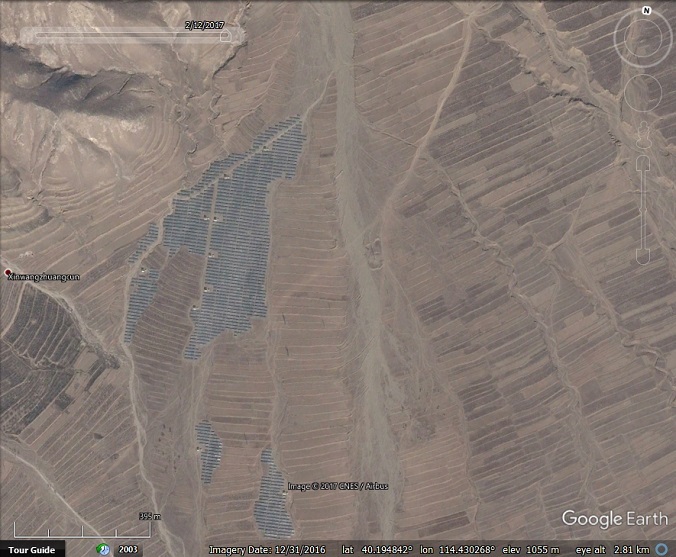 The plants we found in the Datong region were all built in the last few years. According to Wikipedia, China is roughly doubling its installed solar power every year. Exponential trends can’t continue forever, but it does make us wonder what the landscape will look like in ten years. It won’t be long before there is stiff competition for land between solar and agriculture – which is one reason why floating solar is becoming a popular solution. From the plants we found, mountain tops and southern facing slopes seem to be the most popular sites at present in the Datong region. 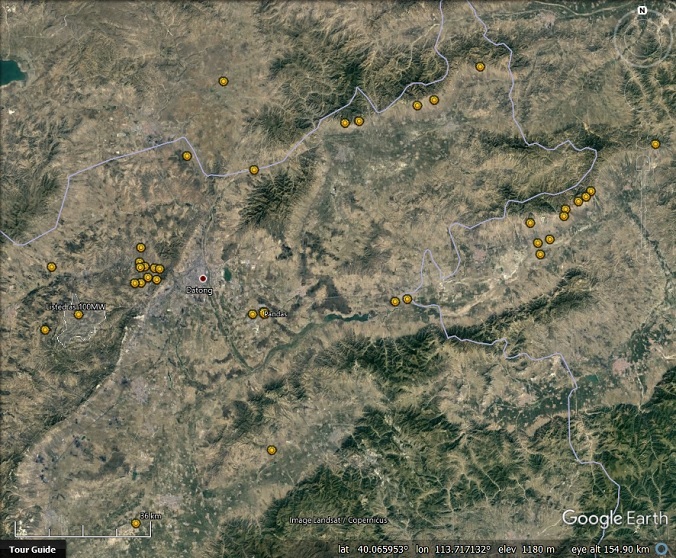 Solar plants around Datong, Shanxi, China. Some plants like the one below, appear to have been built on dry river beds. This is presumably to avoid competition with agriculture, but it does raise the question of whether or not they will get washed away in the large rain storm. Before and After showing how the solar plant is built in a dried out riverbed. 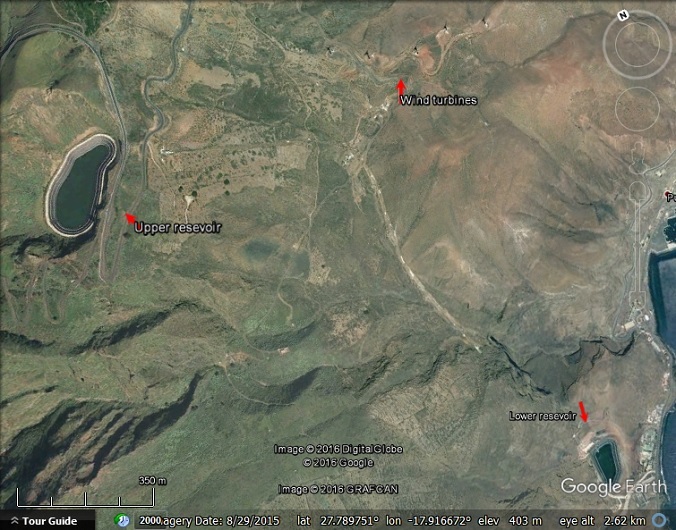 To find the pandas and other nearby solar plants in Google Earth, download this KML file . 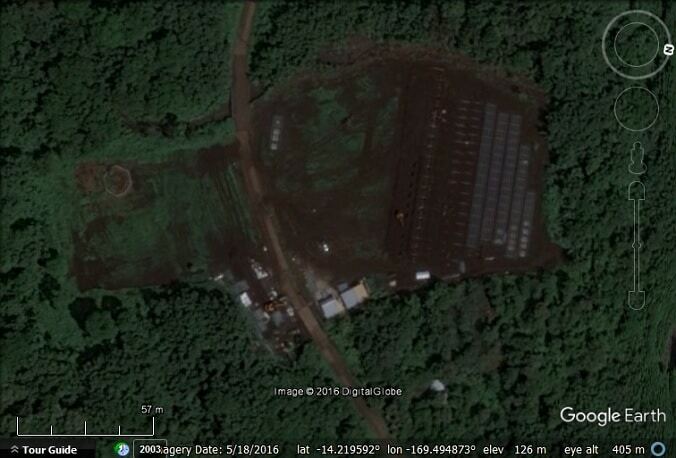 The post A Panda Solar Power Plant appeared first on Google Earth Blog. Floating solar power plant in the same region as the new record holder. Nearby, we found a solar plant under construction that looks like it will be partially over the water but anchored to the ground rather than floating. Solar plant under construction. There are also arrays of stakes off the edge of the above image, so it will be quite a large solar plant. There were many coal mines in the region and the area has suffered subsidence as a result of the mining, which created new lakes. The new record-holding floating solar plant is on one of those lakes, so it serves as a symbol of transformation from coal to renewables. 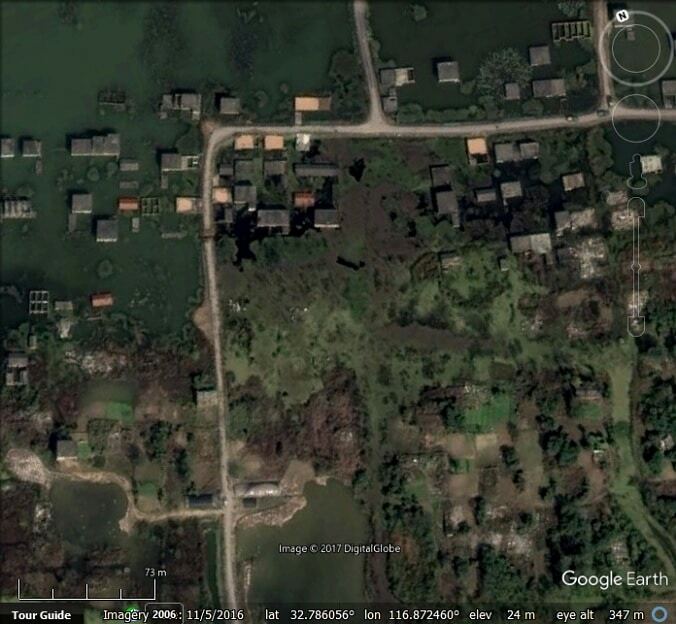 This village was partially flooded due to subsidence. It appears that houses remaining on dry land were demolished. 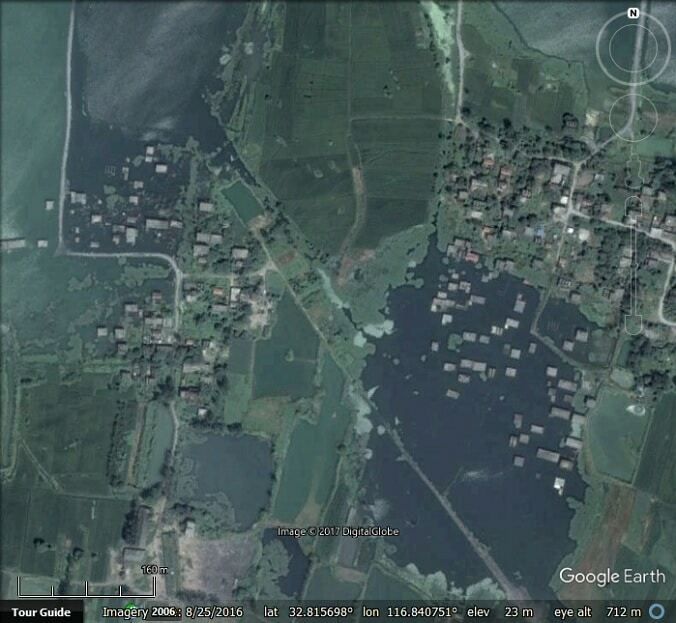 Another village flooded as a result of subsidence. Solar panels become less efficient as they heat up. The water helps to cool the panels, which increases their efficiency. When used on reservoirs, they reduce evaporation, saving valuable water. In regions where land is in short supply, such as Japan, it avoids wasting valuable space. It is presumably cheaper to rotate a whole floating solar plant than land based systems that rotate individual panels to track the sun. The rotation observable in the Google Earth imagery is not very much, but that is likely a consequence of the fact that most imaging satellites have orbits arranged so that they take pictures around mid-day, so we do not see the early morning and late afternoon positions. We came across this article discussing the advantages of floating solar panels, and it mentions that solar plants built over water are often combined with fisheries. It also mentions that the Anhui region of China, where the first solar plants we looked at above are situated, is expected to get around 3.2 GW of floating solar between 2016-2018, so the world record 40 MW plant is just a small part of a much bigger scheme. 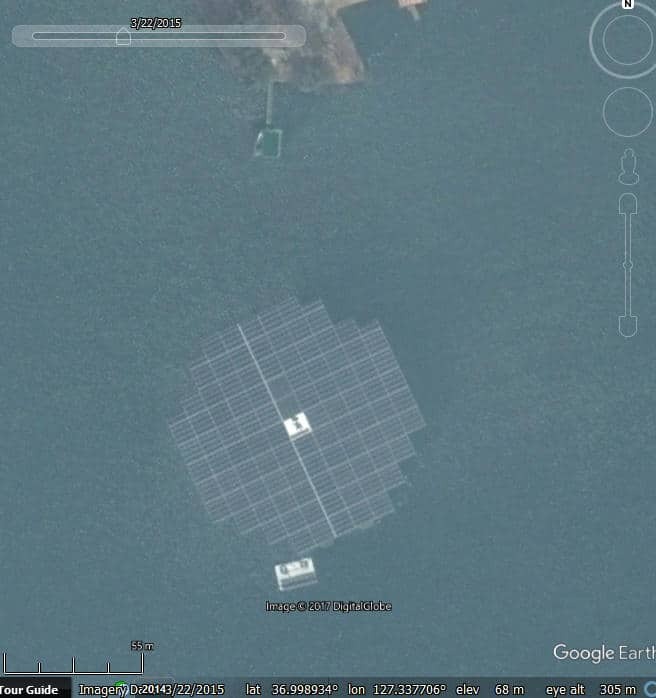 For some pictures of floating solar around the world see this website. For the locations of the places mentioned above as well as many other floating solar plants in China, Japan, and the United Kingdom, download this KML file. 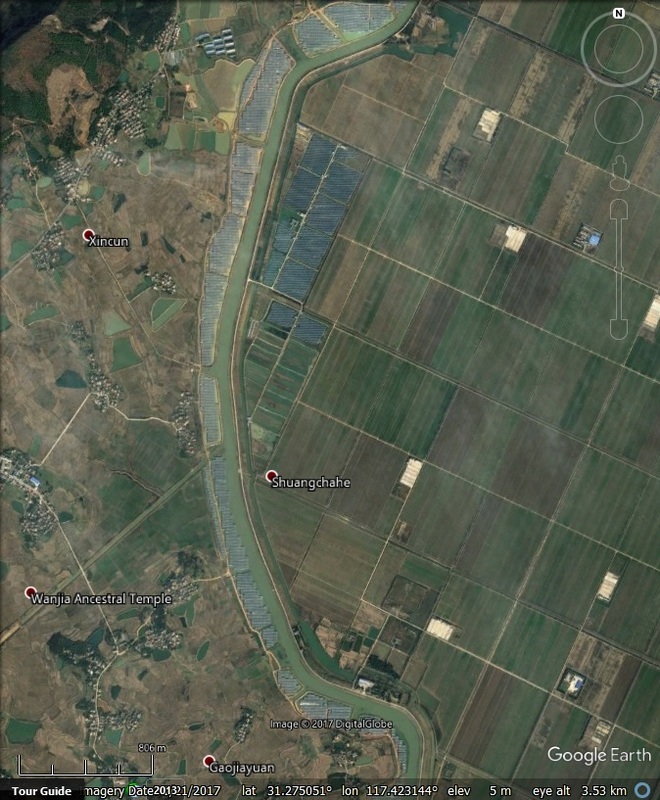 We have also included a few dry land solar plants that we found nearby while looking for floating plants, and a few major solar plants in China. 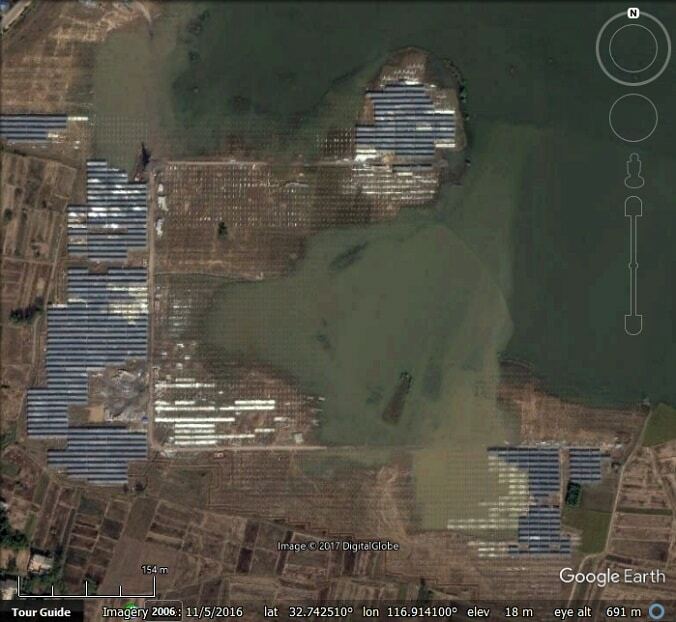 The post Floating Solar Plants appeared first on Google Earth Blog. Tesla has recently agreed to merge with Solar City. To help publicise the merger, Solar City recently published this YouTube Video about a solar installation using Tesla’s ‘power pack’ batteries that now powers the island of Ta’u in American Samoa. Ta’u is not the first island to be powered by solar. The nearby Island of Tokelau has been powered by solar since 2013. Sadly, the imagery is a bit old (a recurring theme in this post) and we cannot see the solar panels. The Danish island of Samso claims to be the first island in the world to go 100% renewable, but we could not find any imagery of their wind turbines. A common complaint about renewables such as solar and wind, is what to do when the sun isn’t shining or the wind isn’t blowing. Tesla solves this problem with batteries. But another island, El Hierro, one of the Canary Islands, uses pumped water storage combined with wind turbines. Moving away from islands, we had a look at this Wikipedia list of the largest photovoltaic power stations in the world (over 100 MW). Solar has really taken off around the world in the last few years, and Google Earth imagery can’t keep up. The second on the list, Kamuthi Solar Power Project, was built in just a few months between June and September 2016 and no sign of it can be seen in current Google Earth imagery. 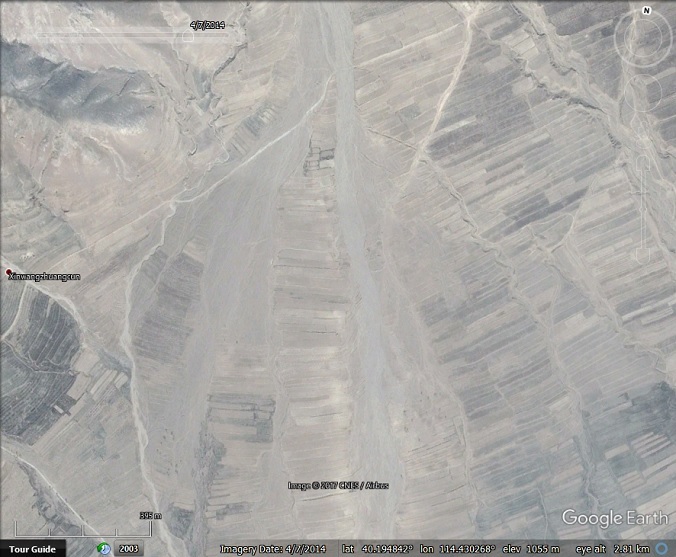 Top of the list is Longyangxia Dam Solar Park, China, which can be seen in Landsat imagery when zoomed out, but as you zoom in to higher resolution satellite imagery, it disappears, as the high resolution imagery was captured before it was built. Longyangxia Dam Solar Park, China. We have put together this KML file which includes the above mentioned islands as well as the list from Wikipedia where coordinates are given. The post Tesla powers an island appeared first on Google Earth Blog.